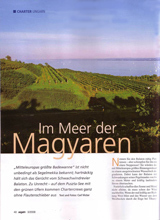 Articles from various nautic magazines about bareboat charter at Balaton. Hungary's closest thing to an ocean is Lake Balaton. About 50 miles long and 3 wide on average it is the largest lake in central Europe. The Hungarians call it 'the Hungarian Sea'. It would be more accurate to refer to the surrounding region as the World's Largest Poolside Restaurant! Sailing on Balaton, refreshment is always close at hand. On crude arithmetic, a boat coasting along the shore of Balaton is, on average, never more than five minutes from good coffee, stuffed pancakes, fried fish etc all done with a distinct Hungarian flourish. This basic fact does much to explain the cleverness of the deal offered by Andreas Novotny from whom we charted a Hungarian built Balaton 25 for a week. At first sight the deal looked a little unlikely and we wondered how it would work out - the boat has no cooking facilities. 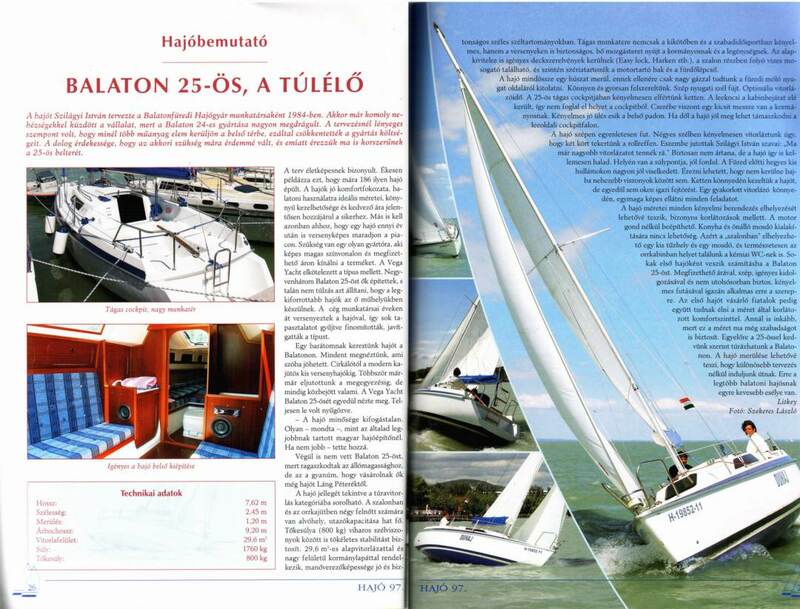 To compensate the Balaton 25 is a pleasure to sail - light and fast but extremely well behaved. Its accommodation does not add up to much more than two settee berths and a pair of V-berths with an infill piece forward plus a sink, fresh water bottle and very adequate locker space. In essence it is a couple of quite decent 'camping' bedrooms that will go from A to B under sail quickly and pleasurably. That is the nub and cleverality of Novotny's formula: when you stop sailing, all the other facilities you want are available ashore - basic facilities, superb food and wine at startlingly low prices, gypsy music ….. The boat is transport, fun and sleeping accommodation: that is all. If you were to charter one of the French concoctions so often used in the charter business you would be paying for three loos and god knows what else when in reality you were still actually using the facilities of a yacht-harbour, snack stall or restaurant. All said and done, EUR 560 for four people for a week is astoundingly cheap and on Balaton the whole thing works extremely well. What is more, the 'conventional' alternative would not be as good a pure sailing boat. The 'pure sailing boat' aspect is important. Balaton is not a place for addicts of the iron topsail. This is tied to the low level of pollution. The lake has to be the cleanest large body of water in Europe. It 'ages' a little over the season but in spring is drinkable without problem. Its reed-beds are home to colonies of freshwater sponges, which act as filters. Balaton is clean but not clear: most of the rivers that feed it come in from the north through soils that are partly chalky, partly volcanic resulting in turbulent pea-green water under many lights. Apart from a high level of public awareness (in a week's sailing on the lake I saw NO man made pollution - not an oil-slick, not a beer can, not a polythene bag) one of the things that maintains the purity of the water is an almost blanket prohibition on the use of engines by pleasure craft ; in and within 300 metres of harbours, in an emergency and to avoid a storm warning you may use your engine - otherwise you sail. This explains why the B25 has an outboard rather than an inboard engine - you can get the prop out of the water and sail faster towards the cup of coffee when the wind is light. Given that Andreas Novotny provides hardware for the young at heart (or perhaps quasi-senile admirers of Swallows & Amazons such as myself), what is a day on Balaton like? Take the day of our long sail from Tirhany to Kesthely (about 35 miles, times distinctly approximate). 07:30 Early risers rise. Shower in marina showers. 08:00 Breakfast for four (filled omelettes, grilled sausages, good coffee, sticky things) from stall comes to about £7. Flavoursome and friendly. 08:45 Set sail. Close fetch in 15-20 knots. Initially under main alone, then main and genoa. Boat bowling along. 12:30 Ábrahamhegy. Lunch. Local wines, fried fish (local and very fresh), salad, sweet pancakes. About the same prices as breakfast. 15:30 At last headland in lake. Decide not to go for coffee and buns at Balatongyörök. Last five miles beat in 8-10 knots, direction varying. 17:30 Showered, shaved and shampooed in bar of hotel at root of pier. Swedish member of party leaves on very efficient public transport to Budapest. The seas were a little short but the boat went through them well. Anything thrown back to the cockpit was warm (fish-tank temperature) and I don't think anyone put on any more sophisticated waterproofs than a light walking jacket (this is normal - average water temperature in mid-September is about 70 F). The sky was initially a series of waves of cumulus followed by a very thin overcast that sometimes generated some quite spectacular lighting effects. The little Balaton 25 went like a rocket but did not need the talents of a team of hot-shots to drive it. Lovely boat - I want one. And for off-boat entertainment? Plenty and well presented. Even apart from its Ferencsay Palace, Kesthely at the head of lake is an elegant town with a population of, say, 10,000. Europe's last large herd of bison lives on a reserve some 20 km away (Public transport is brilliant and dirt cheap. Bicycles can be hired). The table mountain of Badacsony is clustered with vineyards (so is almost any hill around Balaton for that matter). In general the southern shore is more built up with flashier resorts - but don't let this put you off: the shore is still heavily wooded and beautiful and the Hungarian idea of a flash resort with nightlife is much less overwhelming than ours: if you want a strip joint in Siófuk you can find one but it is hardly thrust in your face. Anywhere but in Hungary, Tihany where the Novotny operation is based would be a disaster - as a very picturesque village (Grassmere-upon-Balaton) it would either be selling total tat or charging stupid prices. In reality it is full of quite genuine craft shops selling genuine (and tasteful) ceramics, fabrics etc made on the spot or at any rate locally that put no pressure whatsoever on the wallet. They are true bargains. Besides its shops, Tihany has the Benedictine monastery established by King Andrew I of Hungary in around 1050. Said to be the most photographed church in Hungary it crowns the Tihany peninsula. In its current form its interior is a delight of warm and simple rococo architecture - truly lovely ceiling paintings but without the over-ornateness of many equivalents in Germany, Austria or Italy. Go to Balaton, and go there now: the EU will inevitably drive prices up. Right now it offers outstanding value for money in terms of a sailing experience, gastronomy and culture. Roll on next summer, see you there. Hungary's big lake is almost like a small sea. With temperatures similar to the Caribbean, clean harbours and moderate prices, surrounded by famous vineyards, Hungary's big lake is almost like a small sea. Off Badacsony a light onshore breeze hastens a classic on its way. Then it's out of the harbour and set sail. The jetty at Szigliget offers scarcely any shelter. One should only lie here in westerly to northwesterly winds. The thermometer on the clubhouse of the Balatonfüred yacht harbour shows 34 in the shade. Over it there arches a brilliant blue sky. Only a few small scraps of cloud in the west provide any hope of wind. In any case Swimming trunks and bikinis are social dress in the club restaurant, on the pier and onboard. Beside the bar a jazz band is playing; the mood is relaxed. Yacht charterer Peter Fekete has handed a brand new Hungarian Top 34 over to us. The chart of Balaton shows not only depth contours and important nautical information but also vineyards and wine cellars. As we start the engine, Peter casts off the warps and calls after us: "The most beautiful part of Hungary is the Badacsony vineyard. Ask for Elisabeth's Cellar. There is a special wine there, the 'Grey Monk'." We pass through the narrow harbour entrance busy with traffic. From Beach Cats to 13-Metre Yachts - many boats are going in and out under sail as if in slow motion, and even right into their berths. What is more, the fingers are closer together than in most German marinas. Immediately off the pier-heads I stop the engine for I know from my first Balaton cruise almost twenty years ago that engines are prohibited. Nevertheless, we want to see as many facets as possible of the Hungarian inland sea within a week's charter. It is just a pity that there is no more than a light breeze rippling the mirror smooth turquoise water. Our goal for the day is to the west, the Tihany peninsular - now only four kilometres away. On its crag the most photographed church in Hungary stands in solitary splendour at a height of 219 metres. Since we are making less than one knot under sail, we follow the example of Hungarian crews, letting down the bathing ladder, jumping from the pulpit into the almost bathtub-warm wetness and climbing back onboard aft. Showering off is not necessary because the water is not only clean but also fresh. 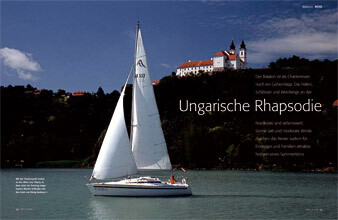 We run towards Tihany with the wind aft thankful for every breath that puts any shape into the sails. Tihany hill on whose eastern slope white villas nestle in parkland is a desirable residence for locals and holidaymakers. We steer for the Mahart Ferry Company's harbour where there is a jetty for a dozen yachts next to the pier for passenger ferries. Like the neighbouring boats we make fast bow-on with a stern anchor. A stroll up to the village affords impressive views over the Hungarian Sea. At the top of the bluff a visit to the abbey is a must. It is one of the oldest churches in Hungary. At the beginning of the 11th century, the Magyars occupied the lands around Balaton. In 1055 King Endre I had the church and a Benedictine monastery built. These are the oldest buildings on Balaton. A mediaeval village clusters around the ecclesiastical buildings. Outside their thatched houses the Hungarians have pottery, plaits of paprika and wine of their own making for sale. Between them, small taverns serving wine tempt you to sample the juice of the grape straight from the barrel. "Tihany is most beautiful place in the world ", an old man whose barrel we failed to walk past tells us in heavily accented German. If one agrees in advance that Hungary is the most beautiful country in the world, he may well be right. We sit in the open on wooden benches and enjoy cool riesling and the view over the lake. That evening we lie in the Tihany Yacht Marina. This small harbour offers the comforts of a modern marina. As in Balatonfüred everything is clean and well cared for but considerably more peaceful. Many boats are long-term residents from Budapest, Southern Germany or Austria. We pay the fixed-rate berthing fee of 1500 forints - about 6.1 Euro or 300 forints per person. Opposite the marina I ask at a guest house by the name of 'Tihany Gyönygye Villa', which is the best restaurant in Tihany and where it is possible to order a taxi for the trip up to it. Instead of giving an answer, Andras, the proprietor of the guest house considers briefly and in three minutes drives us up the winding road to the 'Ziprian', a restaurant with a covered central courtyard. Our driver does not want any money. Instead he invites us to breakfast at his guest house. At the Ziprian we order a Balaton fish platter for three, salad and the trimmings. Bream, pike and pikeperch are superbly prepared and the portions so generous that we cannot manage them. In the end we pay 4300 forints including three pitchers of riesling, about 17.5 Euro. Next day we set sail after a plentiful breakfast at the Gyönygye-Villa. We pass through the narrows at Tihany - only 1200 metres wide - under a morning offshore breeze. Car ferries run to and fro. But then it as if the wind had been turned off. In water with a temperature of 26 degrees, we swim faster than the boat sails. And our objective for the day, the Badacsony vineyard, is 30 kilometres to the west. It cannot even be made out in the haze. If we continue to bob up and down in the calm, it will take a week to get to the most famous vineyard in the country. We have an inboard diesel - should we start it illegally? In 1979 the prohibition on engines was administered strictly, but as two yachts approach under power we fire up the diesel, furl the genoa and leave the main up as an alibi. The police on the lake show no interest in us. At 10 pm we enter the harbour below the vineyard in the failing light. We get a berth on the visitors' jetty, once again mooring bow-to with a stern anchor, but for a cool 4000 forints, although this harbour also belongs to Mahart. In the clubhouse there are a bar, a chandlery, the harbour master's office and sanitary facilities. The shock: the toilets and showers are primitive, cramped and still redolent of the charms of socialism. The sole reason for staying in the marina is the Badacsony vineyard. Grapes are said to have been planted here as far back as Roman times. Past the wine cellars with their invitations in German to taste their wares, we climb our way to the 'Róza-Szegedy House', a traditional Baroque house with an arcade, and on to Elisabeth's Cellar. Outside the little stone house vines intertwine above a crushed lime terrace. In the shadow of the vine-leaves there stand old wooden tables and benches on which the generations of happy topers have carved their names. Through the house you come to the low cellars, full of old wooden barrels. An old Hungarian toasts us in golden-yellow wine and pours it into stoneware pitchers. "Elisabeth was my mother ", says the vintner. She is long-since dead, "But I make the Grey Monk exactly as she did." He fills each of us a stoneware mug as a taster. The delightful Grey Monk, which here ripens on a hot basalt soil and is vinified locally, tickles the tonsils. "The name comes down from the middle ages", the vintner explains. "In those days they had sent us a monk from Vienna to instruct us in the faith. The solitary monk loved the pleasures of the flesh. After drinking the night through he is said to have appeared completely grey. Since then the wine has borne his name." The higher the sun rises above Balaton, the busier it becomes outside Elisabeth's Cellar. There are Saxons, Thuringians and Bavarians who have known the place for years and are already lapsing into joyful song. Elisabeth's son has to fetch pitcher after pitcher from the cellars. His price for a litre is 200 forints (0.70 Euro). To go with it there is home-baked black bread - a rare delicacy in Hungary. Warm from the oven, the slices are spread with dripping and sprinkled with hot, coarsely chopped paprika. Our cruise along the northern shore of Balaton leads inevitably to more vineyards. We sail six kilometres westward to Szigliget. This open finger pier too is a jetty for Mahart vessels. Yachts are allowed to berth on the eastern side, either bow or stern on to the pier. Nobody comes to collect the money. The toilets and water supply on the passenger quay can be used. It is only in an easterly that I would not like to lie here. After a 20-minute hike past pretty detached houses and small guest houses we reach the biggest wine cellar in Hungary. Szigliget's 120 metre long vault houses a wine museum and a 40 metre long table for guests set between metre-high barrels. A rustic supper of sausage, salt pork, garlic and paprika is served. When he eats, every guest can decide on the barrel he would like his juice of the grape drawn from. A whistling in the shrouds and an uncomfortable motion awaken us next morning. The wind has freshened, fortunately from the northwest. At Szigliget Pier our boat is moving with the seaway. We let go the makefasts and recover the stern anchor. We sail eastwards towards Bráhamhegy in the lee of the vineyards. It is only nine kilometres there and we have a stern wind. It is blowing Force 4 to 5 and reminds one that Balaton can sometimes also be somewhat umpety. The visibility has deteriorated to the extent that the southern shore with its bathing resorts and summer mass tourism can no longer be made out. However, we find Bráhamhegy safely. The new marina is protected in all winds; it is simply that some pontoons are still missing. Our boat is too beamy for the few vacant finger berths; we go alongside a lighter. The harbour master at Bráhamhegy is a somewhat odd old man whom we christen Father Abraham. He lives with his dog in a site caravan by the entry gate and explains that the sanitary facilities are not yet finished. We should go to the open-air swimming pool next door for a shower. When we return, hair wet, Father Abraham whispers: "Today is Wednesday so you must go to the 'Rizapuszta', an hour from here up in the mountains. On Wednesdays there is a wine tasting and the most beautiful of the gypsy women will be dancing for you." What a prospect ... When we took our leave from Cellar Master Bartók, a 60-year old Hungarian with a heavy moustache, felt hat and Viennese dialect, it was long since dark. Tomorrow it will be time to start the trip back.